Bonfires mean different things for different people, but in its most basic form it represents one of the oldest instinctual urges of humankind: warmth, fellowship, a light in the darkness, defiance and comradeship all at the same time. 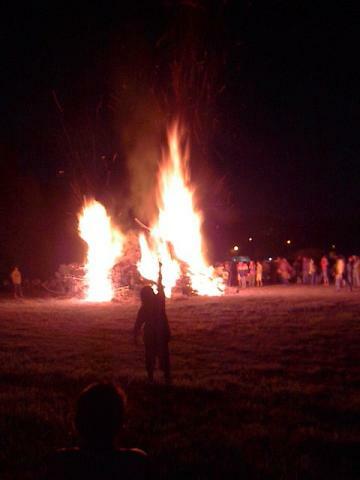 After a pow-wow there is often a bonfire of some sort. This one was on Gunter’s Lake in Alabama. 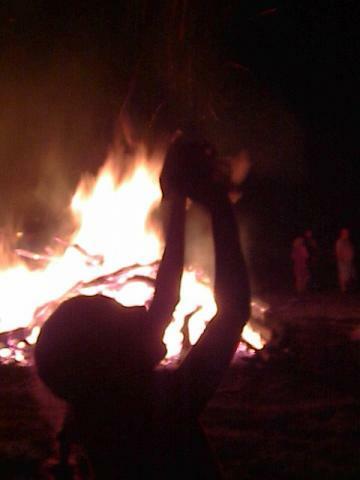 A young drummer stands before the flames. After running about a tag with the other children, he cried out and stuck this pose before resuming his play. You sometimes wonder what theythink as they gaze into the fire’s heart. You feel the enormous heat and power, the danger of the flames, but it important to watch children during those times. It can be hypnotic, and you find some go improbably closer and closer. 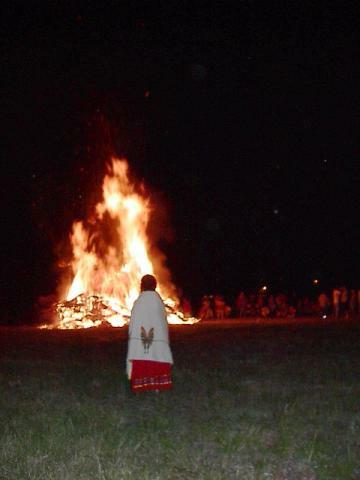 A wise little girl here keeps her distance and solemnly regards the blaze. My son with his hair still in braids, though he’s done the razor cut spikes now, when I found this photo it made me smile. The pose was natural. I was lucky to have caught it. This was a particularly special and amazing photo because of the flame’s form in the background. In Native American pictographs, a female figure with arms raised or a spike pointing from her head to the heavens was a symbol of blessing, knowledge and life. We didn’t know it as this time, but when I took this photo of a close friend, she was newly pregnant at the time. Her man and she had tried long years for another child…and the flames told us the tale. Absolutely stunning. Hynoptic. 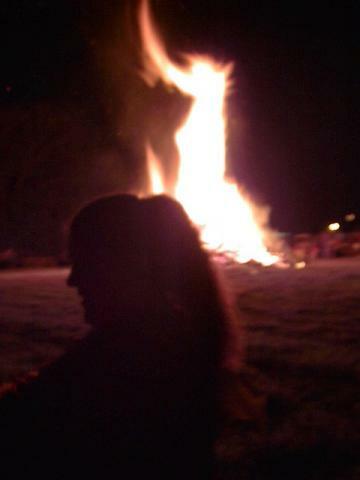 Ancient the need, the joy, the mystery: the bonfire. Posted in Personal Entries, Photos. Tagged american indians, bonfires, native american, pagan, pow-wows.